What changes will make the 2018 Chevrolet Colorado different? Revised styling and the possible proliferation of the eight-speed automatic transmission. 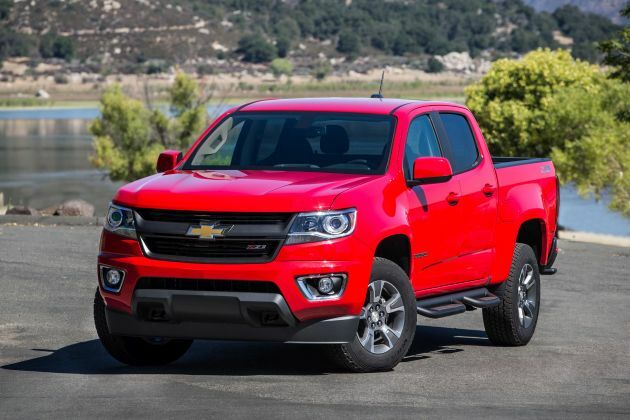 Marking the midpoint in the lifecycle of Chevrolet’s compact-class pickup truck, these updates should help keep Colorado competitive until the next-generation arrives for model-year 2022. Colorado and the mechanically similar GMC Canyon have already received a fair number of enhancements since their model-year 2015 premieres. For 2016, the duo became available with a diesel engine, the first for a compact-class pickup in the U.S. For 2017, an eight-speed automatic transmission became standard on models equipped with the available V-6 engine. Chevrolet also resurrected the radical off-road ZR2 model – a badge last seen on the 2005 S10 pickup — to answer the likes of the Toyota Tacoma TRD Pro. The overall compact-pickup market has seen something of a renaissance over the last couple years. There was arrival of the Colorado and Canyon for 2015; the segment’s sales leader, the Tacoma, was redesigned for 2016; and the second-generation Honda Ridgeline debuted for 2017. An all-new Nissan Frontier is slated for a North American debut in 2018, with a resurrected Ford Ranger not long after that. In sales, Colorado is in second place in the competitive set, well behind Tacoma but significantly ahead of the Frontier and Ridgeline. To get it with the most up-to-date styling and to see if Chevrolet-parent General Motors outfits the standard four-cylinder gasoline engine or optional four-cylinder turbodiesel engine with its smooth and efficient eight-speed automatic transmission. Styling changes would be relatively minor, and would have no effect on available cab/cargo-bed configurations and trim-level designations. The ’18 Colorado would carry over two body styles and two bed lengths. The two-door extended-cab and four-door crew-cab would come with a 6-foot 2-inch-long cargo bed, with the extended-cab continuing on a 128.3-inch wheelbase (the distance between the front and rear axles) and the crew on a 140.5-inch wheelbase. The crew would also return in with a 5-foot 2-inch bed on the 128.3-inch wheelbase. Expect the 2017 trim levels to carry over, staring with the Base grade and ascending through Work Truck (WT), better-equipped LT, off-road-oriented Z71, and off-road-maximized ZR2. It’s well worth considering if you’re OK with its looks, find the powertrain choices acceptable, and want to save some money. Discounts and incentives are likely to ramp up as the 2017 model year winds down and dealers become anxious to clear inventories to make room for the restyled ’18 Colorado. Available for duty as a bare-knuckles load-lugger, a comfortable everyday pickup, and a rough-and-tumble off-roader, it should be easy to find a Colorado that fits your needs and budget. The available diesel engine is an especially interesting proposition; it’s powerful, fuel-efficient, and enables this truck to tow a maximum 7,700 pounds, 700 pounds more than the V-6 and, along with the diesel-powered Canyon, tops in the class. However, if you’re considering a fully equipped Colorado LT or Z71, you might be better served exploring a full-size pickup, such as the Ford F-150, Ram 1500, or Chevy’s own Silverado 1500. Don’t get us wrong, the Colorado is a fine compact. But a four-wheel-drive (4WD) crew-cab LT with the diesel, leather upholstery, and a few other goodies stickers for around $43,400; a V-6 Z71 Midnight Edition 4WD crew cab lists for around $41,300. That’s full-size-pickup territory, where an all-out price war is a near-constant. There’s some advantage to Colorado’s manageable dimensions, but given today’s market, a full-size pickup may be too good a deal to pass up. Almost certainly, but the changes won’t be drastic. Expect the 2018 Colorado to get a new front end that mimics the look of the Silverado. The rear fascia will likely be tweaked. The interior may see a revised instrument panel, steering wheel, and control scheme with the latest version of Chevy’s MyLink infotainment system. Colorado’s cabin will again be a pleasant place to do business, at least for the driver and front passenger. Overall comfort should remain better than that of the Tacoma but a step behind the more car-like but less rugged Honda Ridgeline. Given no changes in cab dimensions, front-seat room and comfort will be very good. In the extended cab, the rear seating area will best suit cargo or small children. 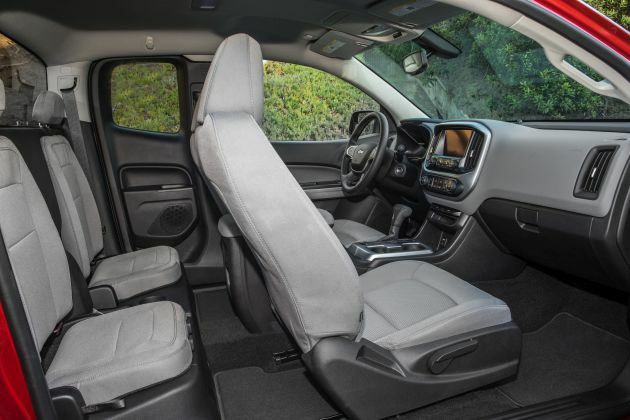 The crew cab’s rear seat is more accommodating for passengers, but there’s no abundance of headroom or legroom. Materials quality will air on the side of durability over luxury, but nothing should look or feel overly cheap. Only if GM makes its eight-speed transmission available with an engine other than the V-6. It won’t alter the engine roster itself. The ’18 Colorado will again be available with three engines, depending on body style and trim selection. The lower-trim models should reprise a 2.5-liter four-cylinder with 200 horsepower and 191 pound-feet of torque. Optional on those and standard on uplevel trims would be a 3.6-liter V-6 with 308 horsepower and 275 pound-feet of torque. The available turbodiesel engine is a 2.8-liter four-cylinder with 181 horsepower and 369 pound-feet of torque. With rear-wheel drive, the 2.5-liter should again come standard with a six-speed manual transmission. Assuming Chevy shelves Colorado’s six-speed automatic, the eight-speed automatic that was made standard for ’17 with the V-6 would become optional for the 2.5-liter four-cylinder, and possibly newly optional with the diesel, as well. Rear-wheel drive would be standard across the board. Optional would be a pair of four-wheel-drive systems, both with a low-range gear set for off-road use. WT versions would have a part-time setup that should not be left engaged on dry pavement while LT and Z71 models would get GM’s Autotrac full-time 4WD that can. Z71 models would come with off-road suspension tuning. The ZR2 would build upon this with a further uprated suspension, front and rear locking differentials, and a dedicated Off-Road Mode that dynamically adjusts the calibration of the engine, transmission, and traction control systems for more extreme conditions. Despite its traditional body-on-frame construction, Colorado delivers a reasonably car-like driving experience. It rides surprisingly well, handling is sharper than you would expect, and the cabin is quiet. Aside from a bit of clatter at idle, you’d be hard pressed to tell the difference between the diesel engine and its gasoline counterparts. Unless your budget is extremely limited, we’d avoid the 2.5-liter four-cylinder in favor of the smooth, refined V-6 or the diesel. The base four-cylinder and diesel engines might see a small bump in EPA ratings should GM equip them with the eight-speed automatic transmission. Ratings for V-6 Colorados should be unchanged. EPA ratings for the 2018 Colorado were not released in time for this report, but the 2017 ratings provide a baseline. For the 2017 Colorado with the 2.5-liter engine and rear-wheel drive, ratings were 19/26/22 mpg city/highway/combined with manual transmission and 20/26/22 with the six-speed automatic. Rear-drive 3.6-liter models, which have the eight-speed automatic, were rated 18/25/20 mpg. Ratings for the 2WD diesel/six-speed-automatic combo were 22/30/25 mpg. All 2018 4WD Colorados will again have an automatic transmission. For ’17, EPA ratings were 19/24/21 mpg with the 2.5-liter engine; 17/24/19 with the 3.6; and 20/28/23 with the diesel. Due to its high-riding suspension and chunkier off-road-ready tires, the ZR2 with the V-6 was rated 16/18/17 mpg. The diesel was available on the ZR2 as well, but its EPA-estimated fuel-economy ratings were not available in time for this report. Gas engines would again use regular-grade 87-octane fuel. The V-6 employs GM’s Active Fuel Management, which deactivates half the cylinders while cruising and with light loads to save fuel. Aside from a couple new paint colors and maybe a special edition package with unique trim bits, we wouldn’t count on it. Most standard and optional equipment should carry over. 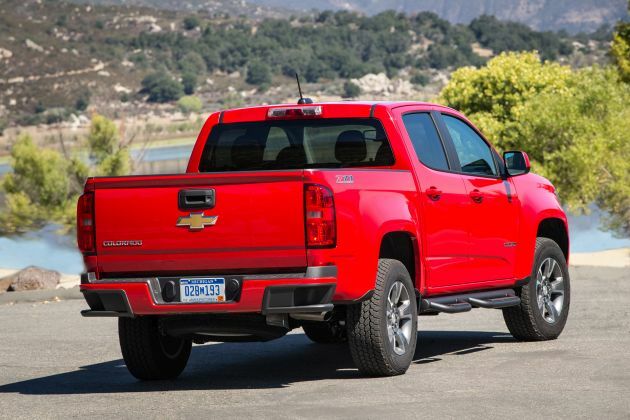 Base Colorados are meant to be price-leaders. They exist solely as an extended cab with rear drive and manual transmission. They do come with power windows and locks, a rearview camera, and power driver’s seat. That’s about it, though. They don’t even have a rear seat or interior carpeting. The WT adds a rear seat, carpeting, and a standard automatic transmission. You can get this one in both body styles and bed lengths, with 4WD, and the V-6 engine. It also offers a number of optional convenience features that we’ll detail below. Most Colorado shoppers will likely start with the LT. It adds more upscale exterior trim, aluminum, rather than steel, wheel, remote keyless entry, and Chevy’s MyLink infotainment with an 8-inch touchscreen interface. In addition to its off-road suspension, Z71 models add an automatic locking rear differential, protective underbody skid plates, a dampened rear tailgate, power front-passenger seat, and automatic climate control. The ZR2 would have similar equipment levels as the Z71 but with the aforementioned off-road hardware upgrades. They’ll almost certainly increase. How much depends on the extent of the 2018 updates. Actual pricing will be announced closer to the truck’s on-sale date. Our estimated base prices include Chevy’s destination fee, which was $995 on the 2017 Colorado. Expect Chevy to keep the Base trim level’s pricing at $20,995. That sub-$21,000 mark is a strategy to entice shoppers who might be upsold to a better-equipped Colorado. With rear drive, estimated base-price range for extended-cab ’18 Colorados is $24,500-$30,500. Estimated base prices for crew cabs with the 5-foot-2 bed would likely span $27,000-$32,500. Figure a base-price range for crew-cab long-beds of $29,000-$34,000. Expect the 2018 Colorado ZR2, which is 4WD only, to start around $41,000 for the extended cab and $42,600 for the crew cab. Prices to upgrade drivetrain components would depend on which trim level, cab, and bed you select. Moving to 4WD from 2WD would pack on a hefty $4,000-$5,000. The 3.6 V-6 would add about $1,235. The diesel four-cylinder will set you back about $3,500-$3,700. Major options for the WT would include the $2,250 Custom Special Edition Package, which includes upgraded exterior trim, MyLink infotainment, and GM’s OnStar telematics. The $490 WT Convenience Package would add remote entry, cruise control, and dampened tailgate. LT buyers are eligible to add the Convenience Package ($690), which adds a sliding rear window, remote engine start, fog lights, and dampened tailgate. The Luxury Package ($1,080) adds heated front seats, power front-passenger seat, automatic climate control, heated outside mirrors, and chrome exterior trim. The Midnight Edition Package ($4,410) nets jet black exterior trim and paint, a spray-on bedliner, body-color grille, and a folding tonneau cover. The Z71’s Midnight Edition Package is $4,980 and includes the same items as the LT’s version but adds a unique wheel design. A $395 Safety Package for the LT and Z71 includes forward-collision alert and lane-departure warning. These are all the driver-assistance features offered on the Colorado as of 2017. Without items such as adaptive cruise control and autonomous emergency braking, this truck is ineligible to receive the coveted Top Safety Pick award from the Insurance Institute for Highway Safety. The ZR2 would offer a number of dealer-installed dress-up and performance accessories, including an off-road roll bar ($1,145), specific wheels ($2,095), and an uprated exhaust system ($1,195). At about $38,000, a 4WD LT Crew Cab with Safety, Convenience, and Luxury packages is probably the sweet spot of the Colorado lineup. Again, bear in mind that a similarly equipped Chevy Silverado 1500 with a V-8 engine is probably not going to be too much more expensive once you’ve taken into account the massive incentives that are available. Try them both before you commit to buying. The 2018 Chevrolet Colorado will probably come out in the fourth quarter of 2017. Addition of a full suite of driver-assistance features. Ridgeline and Tacoma both offer the added security of blind-spot alert and rear cross-traffic detection. Lower prices would be great, too, considering that Colorado can step on the toes of its bigger Silverado cousin.